Intel and the USB-IF have announced the next evolution in “do it all” cables – USB4. It will double the available bandwidth over the newly-renamed USB 3.2 Gen 2x2 to 40Gbps. With that much throughput, a single cable can handle multiple simultaneous display out and data streams. It can drive two 4K displays at 60Hz, for example. USB4 isn’t entirely a new protocol, however. 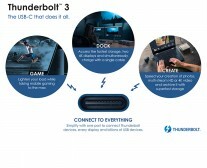 It builds on Thunderbolt 3, which Intel just contributed to the USB group and made available for royalty-free implementation. 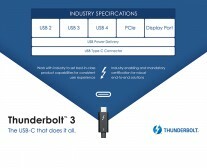 USB4 will still be fully backwards compatible with the older USB 2.0 and 3.2 standards. Note that you’ll need 40Gbps-certified cables to hit the maximum speed. We’re talking USB-C to USB-C cables only, the USB-A plug doesn’t have enough connectors (no, not even the USB3 ones). 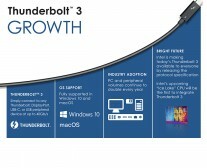 Thunderbolt has mostly been used by Apple so far (because of its proprietary status), but Intel is working with Microsoft to ensure trouble-free support on Windows 10 and it hasn’t forgotten about Linux computers either. Now over 50 companies are participating in the final stages of the USB4 certification, which will be published in the middle of this year. Considering that USB 3.2 was announced in 2017 and still hasn't seen wide adoption, USB4 is probably a few years away from consumer hands.